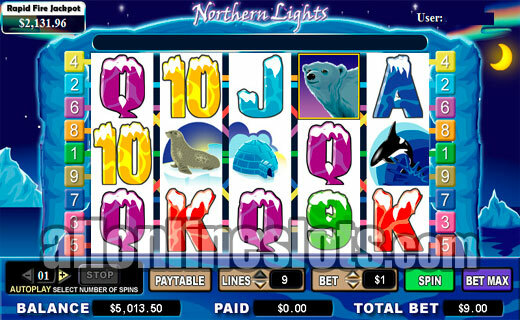 Northern Lights is an Artcic theme slot with a pick a box bonus and a top line win of 6,000 coins. The bonus feature is triggered by getting three or more Aurora symbols. You then get to pick icebergs which each pick awarding up to 2000X your bet. When I first loaded up Northern Lights for this review I was really excited as it looked like it might have a similar feature to the Penguin Pays video slot from Aristocrat. A quick look at the pay table and I found that this was not the case, in fact the bonus on Northern Lights is even better! The game is a five reel, nine line video slot. It has a top jackpot on the reels of 6,000 coins and is also connected to the Rapid Fire Jackpot network. The Rapid Fire feature means that at any time you could be awarded with a random progressive jackpot. This definitely adds to the excitement. All of the symbols on Northern Light has a winter theme with polar bears, eskimos, seals and igloos all featured. There is also a scattered Aurora symbol and a range of snow covered card vales from ace to nine. The polar bear symbol is wild for everything except the aurora symbols. 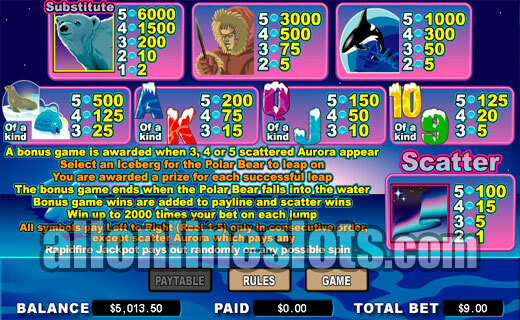 Line up five wild polar bears and you win the top prize on the reels of 6,000 coins. Second highest pay is 3,000 coins for five eskimos and third highest is 1,000 coins for five killer whales. The scattered aurora symbol pay up to 100 times your total bet and are also the way to the bonus stage. Hit three or more scattered Aurora symbols appear anywhere on the reels and you then go to the bonus screen where you can guide the polar bear to serious cash. 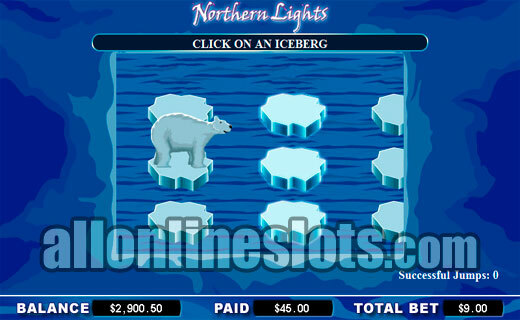 Choose your icebergs carefully as the bonus game ends when the bear hits the water. View the bonus game. There are some serious jackpots on the bonus game as every successful jump can award up to 2,000 times your total bet. Play max bet at the nickel coin size this would equal $900 and at the highest coin size of $5 this would pay a massive $90,000. Some of the biggest bonus game wins we have seen. Northern Lights is featured at all casinos that use Cryptologic software. It is a great game to play and offers some great ways to win with the Rapid Fire Jackpots, the regular spins and the bonus game.